Russell Wilson has been a thorn in the 49ers’ side ever since he was named the Seahawks’ starting quarterback in 2012. Wilson’s Seahawks are 11-3 in 14 career games vs. SF. The quarterback also helped hand the 49ers one of their most devastating losses in the 2013 NFC Championship Game. Wilson’s days in Seattle could be numbered, however, according to a report by longtime NFL scribe Peter King. According to King’s sources, if the Seahawks and Wilson don’t work out a long-term deal by Monday evening, it’ll be off the table for good. Wilson, 30, is entering the final year of his contract worth $17 million next season. The seven-year veteran reportedly gave the Seahawks an ultimatum for a long-term renegotiation of that deal, one that “likely include devices to adjust future years of the deal based on how high the cap goes up year to year, or based on new revenue streams.” If a deal doesn’t get done by Monday, the Seahawks are expected to be willing to place the franchise tag on Wilson for at least the next two seasons, which would pay him upwards of a combined $66 million over that time. 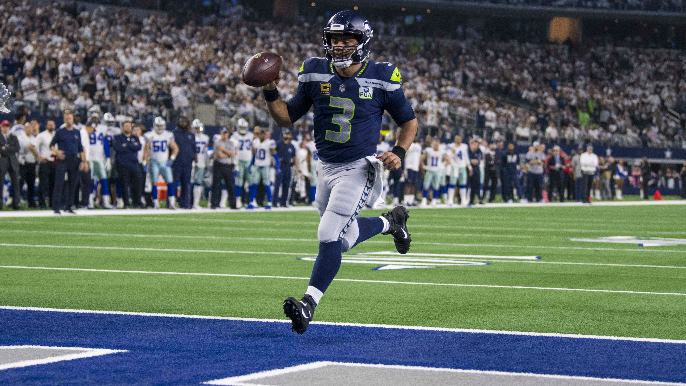 King believes the Seahawks are unlikely to trade Wilson, something that has been rumored, with the Giants as the most buzzed about potential suitors. Wilson is the second-highest-rated quarterback in history (100.3). He has 83 career wins, regular-season and postseason, in seven years, an average of 11.8 a year.